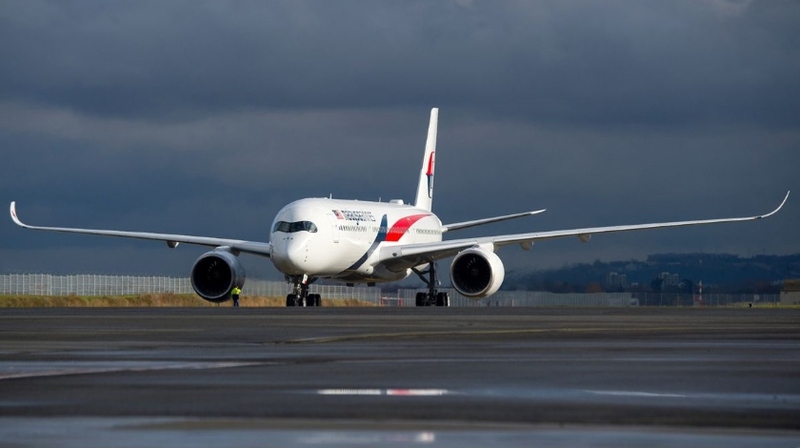 Malaysia Airlines Berhad (MAB) has taken delivery of its first A350-900, leased from Air Lease Corporation (ALC), becoming the 17th airline to operate the world’s newest, most modern and efficient twin engine widebody airliner. The delivery was celebrated upon arrival at Kuala Lumpur International Airport. ALC receives its first A350-900 out of an order for 29 A350 Family aircraft. Eventually Malaysia Airlines will operate six A350-900s, all leased from ALC. Malaysia Airlines will initially deploy the aircraft on flights within Asia. From the first quarter of 2018, the A350 will fly on the airline’s premier long haul service from Kuala Lumpur to London. Malaysia Airlines is the first carrier to offer a First Class cabin in the A350-900. The aircraft is configured in a three class cabin layout with a total of 286 seats. This comprises four in First Class, 35 in Business, featuring convertible seats to fully flat beds and 247 in Economy. Malaysia Airlines already operates 24 Airbus aircraft including six A380, 15 A330-300 and three A330-200F on its regional routes and long haul services. “Our first A350-900 represents a milestone for ALC, and for Malaysia Airlines. We are very confident that the A350-900 will deliver outstanding performance, efficiency, and economics for our airline customers” said John Plueger, CEO and President of Air Lease Corporation.